Home > News & Events > Downsizing Your in-house Die Stamping Operation. Downsizing Your in-house Die Stamping Operation. Die Stamping is our Business! Has been for 76 years! Need to downsize your in-house die stamping operation? We have the equipment and the capacity to make that happen! Why tie up space, capital and personnel with stamping dies and equipment that is rarely used or poorly maintained? Much of our work comes from companies with stamping needs they had formerly handled in-house. 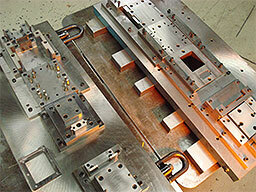 Tool and Die Repair and Reconditioning – We build, sharpen and maintain all our own stamping tools and dies in house. This guarantees the production of quality parts and preventive maintenance of dies and tooling, reduces our costs considerably. Those savings get passed on to our customers. Bahrs Tool & Die experts are able to meticulously care for and maintain your custom dies, guaranteeing dependable runs, and superior quality parts. Bahrs Die & Stamping is owned by highly trained tool and die experts, with over 60 years combined experience that is hands on in house daily. Experiencing long lead times? Our engineers can, and have already adapted existing stamping dies to one of our 16 presses to provide you a seamless transition. Let Bahrs Die and Stamping handle your stamping needs. We’ll take your existing dies, clean, repair, modify, adapt and maintain them to give you the highest quality parts at the best prices possible.